Art is a part of every moment. Make it so. Join us for spirited "Art Talk" and visit our wonderfully creative art community. Often considered the most spontaneous form of printmaking, monotype is a fun and experimental form of expression. It is closely related to painting and is accessible to new and experienced artists alike. We will be using water based Akua Inks which can be printed without a press and clean up is easy with safe, non-toxic clean up methods. 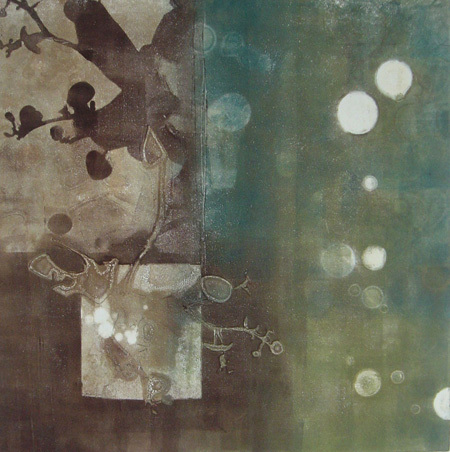 Instructor, Amber George, will demonstrate a variety of printing techniques. Both additive and subtractive methods will be explored, including stencils, rubbing alcohol resists, viscosity resists and multiple pass prints. An experienced instructor and artist, Amber gives one-on-one attention to make sure that each student is able to express their own ideas effectively and creatively. All materials will be provided, including 5 sheets of 22×30 paper. Additional paper can be purchased from the instructor. Students will want to bring the following materials: notebook, smock or apron, images for inspiration, stamps, texture materials like burlap, bubble wrap or other materials with an inherent texture, stencils, scissors, cutting knife like X-acto and cutting mat, a package of baby wipes and a roll of paper towels. Amber George is a painter and printmaker and received a BFA from UCLA in 1994. She currently resides in Fallbrook California, a growing artist community in North San Diego County. Her work is represented by galleries across the country where she frequently shows her paintings and monotypes. Her work was featured in Embracing Encaustic, a book highlighting encaustic painting techniques. She has been teaching adults and children in San Diego since 2001. Limited enrollment space for this workshop, so sign up early. Registration fee (includes lunch and snacks), if you sign up before June 11, 2011: $195 for non Arts Alliance members; $165 for Arts Alliance members. Add $20 to registration fee after June 11th. Refund will be given minus $25 administration fee, for cancellation if made by June 11th. This entry was posted in Amber George, art classes, Arts Alliance and tagged Amber George, monotype on May 24, 2011 by Elsah. Starting on June 20, for seven Saturdays, from 12-2 pm, the Discoveries West Gallery and Archives offers Youth Art Classes for kids age 10-16. Materials will be included including acrylics, watercolors, pencil, India ink, and charcoal. Class fee is $35. Call 550-471-8657 for registatration. Starting on July 8, weekly 90 minute Acting Classes for Young People will commence for ages 9-16. The classes will be taught by Eileen Farrell of Three Rivers, a professional director and former Hollywood talent agent. Class fee is $65 per month, with free introductory class. Call 559-561-0361 for information and details. This entry was posted in art classes and tagged acting classes, art classes, Three Rivers on June 16, 2009 by Elsah. This website is a service for the local arts community by artist, Elsah Cort.